It takes some juggling to keep all the pots moving for asparagus eggs benedict. I'd recommend a helper and/or cooking for just a few. But still, it's decidedly delicious, a great way to cook skinny spears of asparagus and use up homemade hollandaise. The asparagus were so fresh and so small that once chopped, they quick-quick sauteed in butter in just a flash, maybe five minutes. Even if you're not interested in the fuss and calories of English muffins, Canadian bacon, poached eggs and hollandaise, still, try the asparagus all by themselves -- very very good! On a lark, I tried the Weight Watchers brand of English muffins. Harrrummph. They were cardboard-tasting AND pricey -- $3.59 vs $1.79 for Trader Joe's whole wheat English muffins (I love these!) and $1.99 for Bay's English muffins (long-time favorites). The only upside is that the Weight Watchers muffins add up to 1 point, the others to 2. But the real difference is minimal: 30 calories and 1 1/2 fat grams. Talk about "less is definitely more" and not in a good way. FROM THE ARCHIVES Vegetables for breakfast? Of course, the Recipe Box! Wash the asparagus and snap off the woody ends. Cut into 1/4 inch pieces and saute in butter a skillet til just done. In a large shallow skillet, bring salted water and a splash of vinegar (which helps the whites set) to a boil. Reduce heat to maintain a slow simmer. Carefully slip four eggs into the water (it helps to drop them in small bowls beforehand, then gently slip into the water) and let cook, using a spoon to ladle water over the tops if needed. Cook til just done. (With liquid or soft centers, the eggs will not be fully cooked and so shouldn't be served to anyone concerned about raw eggs or salmonella.) Remove with a slotted spoon, draining well. Eggs benedict has always been one of my absolute favorites! I love everything about this. I second that... how much better does it get?! Very nice. Eggs and asparagus go perfectly together. Great recipe and that's a great pic too. Thanks! Oh gosh, I bet that tastes icredible! 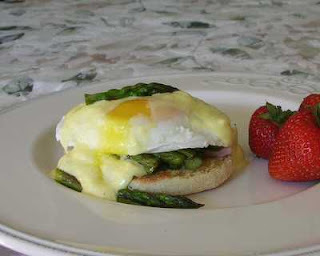 I love eggs benedict, and lately I've been stirring asparagus into my morning egg instead of cheese. This looks like a great way to splurge on a treat! Just a thought about the difference in the English muffins: maybe the Weight Watchers muffins weigh less? Smaller portion = fewer points? S'kat ~ The asparagus was a brilliant addition, if I may say so myself. Erika ~ Yummy. And what a huge difference in calorie consumption. SusanG ~ Nope, the same. I think maybe the USDA specifies portion size because they're nearly always the same, product to product.